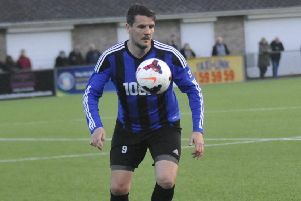 Little Common player-manager Russell Eldridge said the football club’s hard work was rewarded after completing part one of a probable league and cup double. The Commoners lifted the Macron Store Southern Combination League Division One Challenge Cup following a 4-3 victory over Oakwood in a dramatic final at Newhaven FC yesterday (Wednesday) night. Goals from Lewis Hole (2), Ryan Paul and Wes Tate gave Common their first ever Southern Combination League trophy at first team level. Common cruised into a 3-0 half time lead, but were pegged back to 3-2 by the 83rd minute. Hole’s second made it 4-2 in added time and although Oakwood then had two players sent-off, the Crawley side nabbed a third goal right at the end. “We didn’t play well in the second half, but we did well in the first half and that was the most important thing,” continued Eldridge. “We won the game and I’m over the moon. “The second half was a little bit difficult really. I think the conditions maybe deteriorated a little bit. We couldn’t really get a foothold, and we didn’t have the tempo and the pace that we controlled in the first half. We invited them on to us a little bit. “It got a bit nervy at times, but having said that we had a couple of opportunities. At the end of the day we’ve won and we’re celebrating in the dressing room with the cup. “It definitely wasn’t complacency that’s for sure because we don’t get complacent. We just couldn’t get a foothold on the ball and we maybe made the wrong decisions at times, but ultimately that’s all forgotten about now because we’ve won the game. With one bit of silverware secured, Common will now turn their attention to picking up a second piece. They will be crowned league champions as long as they avoid a six-goal defeat in their final game of the season at home to Billingshurst this coming Saturday. Kick-off at The Oval is 3pm. Common are top of the table on goal difference from second-placed Langney Wanderers, who have already completed their fixtures. Billingshurst are third-from-bottom heading into tonight’s game against Midhurst & Easebourne. Saturday’s match will be their fourth in eight days and they lost 3-1 at home to Common in November’s reverse fixture. Common will be keen to secure top spot with a 28th league win of the season having lost their last two league encounters, against Langney and third-placed Lingfield. “We’ve been disappointed with the last couple of league games,” Eldridge added. “We’ve let our standards slip, we’ve not had the quality we should’ve done and that’s been disappointing from our point of view. “Because we’ve been at the top for so long this season, we wanted to get it done, not in style, but better than we have done. For a report on the cup final click here. For a slideshow of pictures from the game click here.